Lead actors Nawazuddin Siddiqui, Bidita Bag and Divya Dutta launched the official Babumoshai Bandookbaaz trailer at a grand event in Mumbai on July 11, 2017. The trailer launch saw a village set up with Nawazuddin sitting on a jute cot. 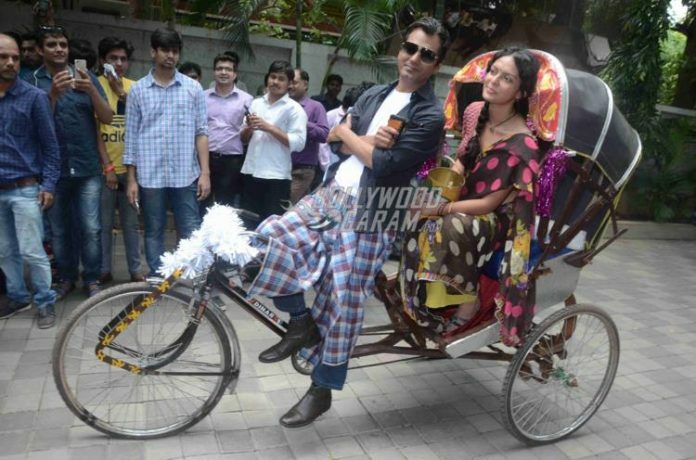 The lead actors were also seen riding and posing on a bicycle while they were dressed in their characters. Nawazuddin Siddiqui will be seen playing the role of a contract killer, who fears his reputation is on stake when a rival, Banke comes in the story. The trailer is packed with some powerful, hard hitting dialogues which take us back to the rawness of Nawazuddin’s character in Gangs of Wasseypur. The film is directed by Kushan Nandy and produced by Kiran Shyam Shroff and Ashmith Kunder. The film is set in the rural hinterlands of India and also stars Jatin Goswami, Shraddha Das and Anil George in supporting roles. Babumoshai Bandookbaaz is expected to release on August 25, 2017. Photo & Video credits – Viral B. Previous articleExclusive footage from Neetu Kapoor's 59th birthday bash! Next articlePhotos & Video - Dharmendra, Bobby Deol, Sunny Deol launch official Poster Boys trailer!